Quilt Top Finished – My Sister’s Quilt! 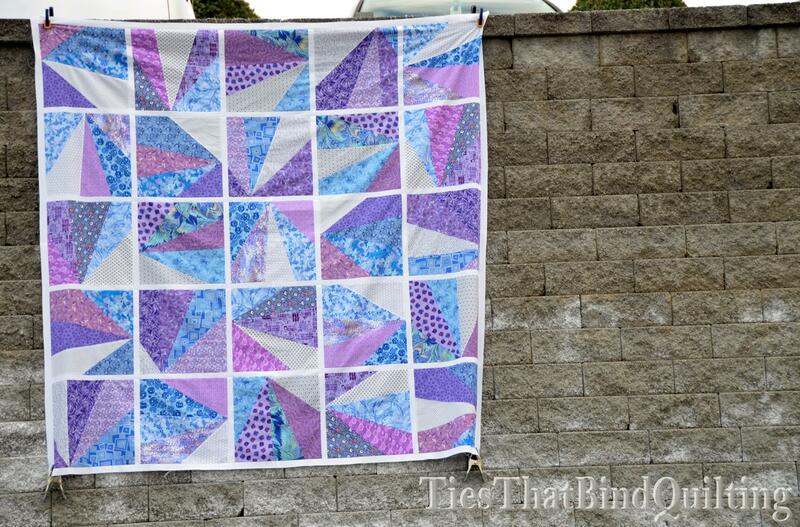 This weekend I finished adding the last of the sashing and borders to my sister’s quilt and did a little photo shoot. I wanted to show it off a little better than the poor lighting shot in my last post. 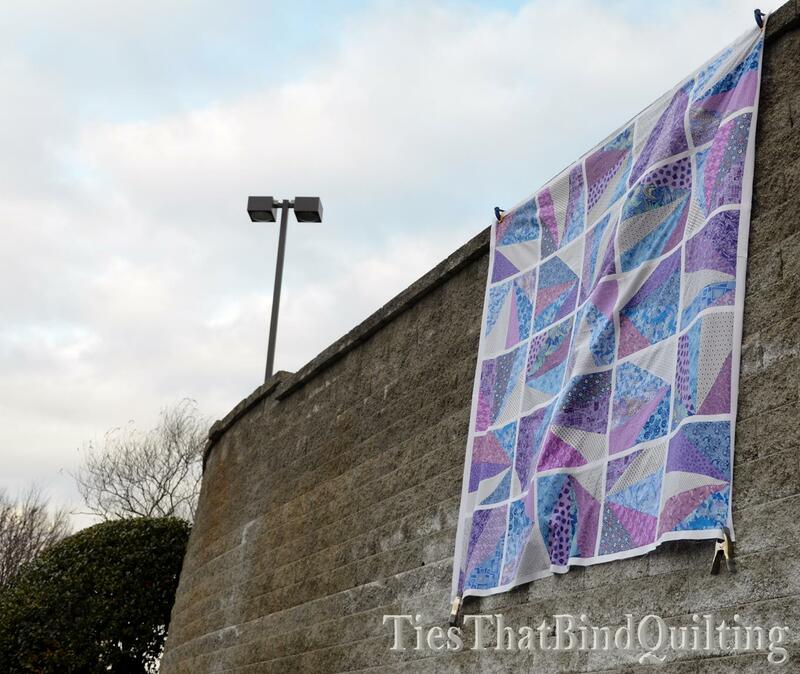 The wind wasn’t being super cooperative today so I couldn’t get it to hang quite flat but you can still see the full quilt pretty well. The colors are much more vibrant than they looked in my dim extra bedroom too! 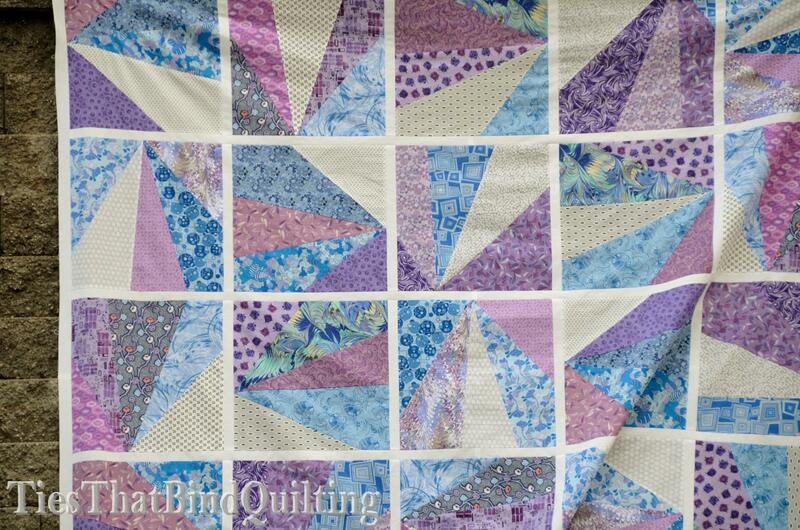 I feel like the quilting on this is going to be way trickier than on the baby quilt I made. 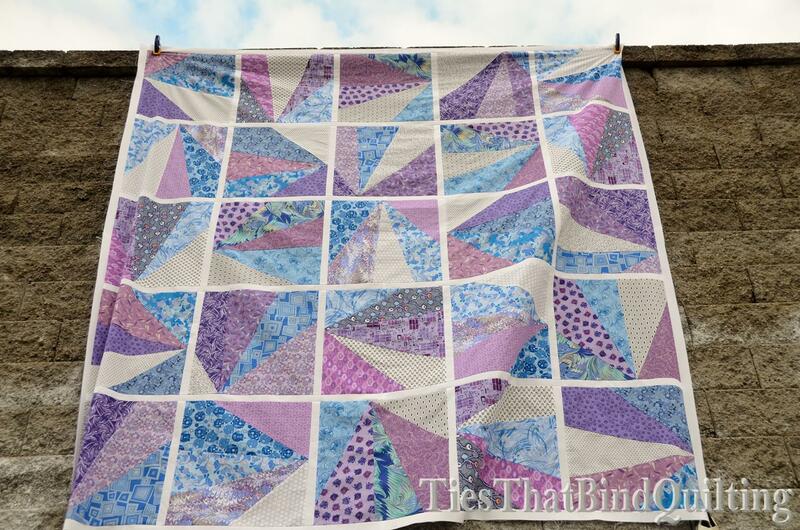 This quilt is over more than 80″ by 80″! That’s a lot of fabric to maneuver through my domestic machine! I can’t wait for my sister to see this! But I’m having trouble coming up with a good name. The colors are definitely cooler and I was leaning towards something like “Ice Crystals” but I’m just not sure. Any suggestions? 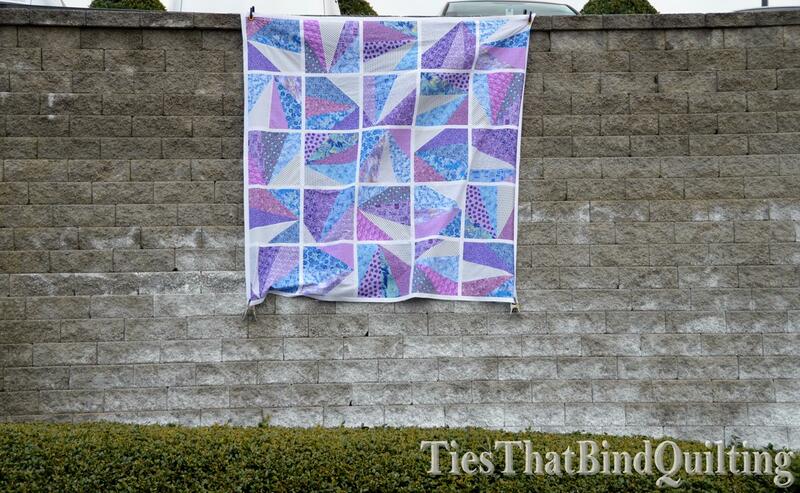 This entry was posted in Work in Progress and tagged blue, Modern, purple, Quilt Top, work in progress by Kim M. Bookmark the permalink. Read your “beginnings” on Marelize’s blog. 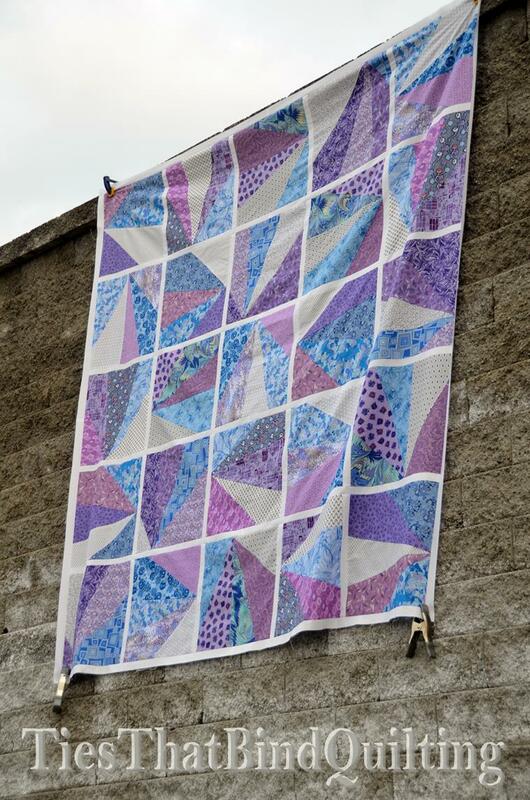 Isn’t it amazing how the quilt bug bites and won’t let go. You have great quilts to show for it. Love your quilt. The colour fabrics you’ve used are lovely. Looks like a geode when broken open. Photographing in Winter weather is always a pain – you did a great job with the photos! Love the colors. It’s so soft and relaxing. That turned out great! I can’t wait for some better picture weather. This looks great! So creative! 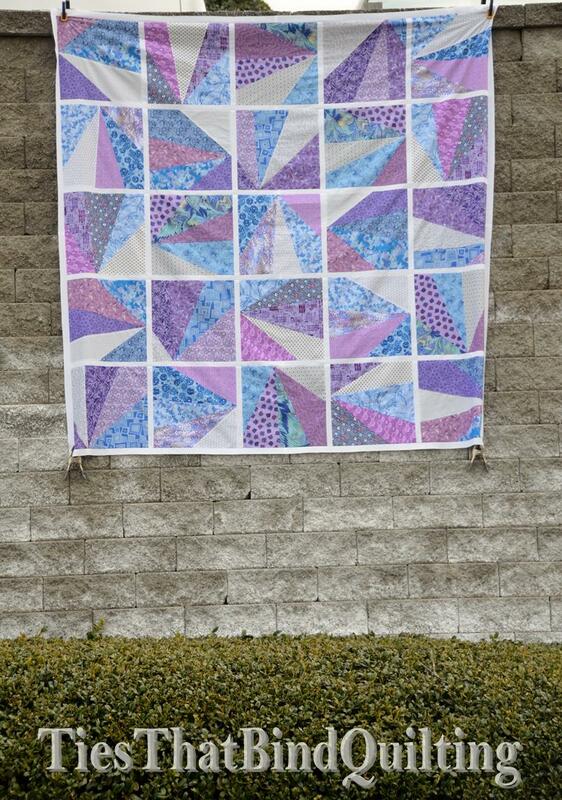 Did you use a pattern, paper piecing, or improv? Beautiful quilt and you are a trendsetter!! Something with Crystal in it would be a great name. Thanks for sharing. Beautiful quilt! And 80″ square is quit an accomplishment! I think the name Ice Cystals is perfect. Loving all the orchid. Congrats on such a beautiful finish. Good luck with the quilting. Just take your time and take breaks. You can do it! Maybe you should consider a name with the word Orchid in it? Chrystal Orchid? 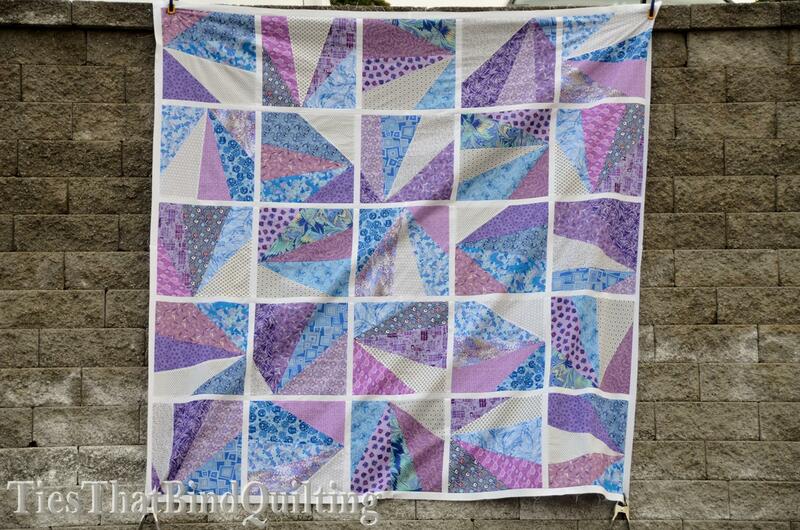 beautiful quilt, and those colors are sooo pretty! How about something with the word “amethyst” since they are purple crystals? So pretty! You sister is so lucky!! Yes, you are a trendsetter. It is a beautiful quilt! Ooh, I like the suggestion of amethyst. Perhaps Amethyst Refractions? How about ” Coastal Sunset”, what ever you call it she is gonna love it! So pretty! Your gonna have a happy sister! Love the colours. So sweet. Love the colors, the pattern, everything about it but not sure about “ice crystals” as a name. Your sister is going to love this.